Not to be confused with Lectin or Lecithin. Leptin (from Greek λεπτός leptos, "thin") is a hormone predominantly made by adipose cells that helps to regulate energy balance by inhibiting hunger. This hormone acts on receptors in the arcuate nucleus of the hypothalamus. In obesity, a decreased sensitivity to leptin occurs (similar to insulin resistance in type 2 diabetes), resulting in an inability to detect satiety despite high energy stores and high levels of leptin. Structure of the obese protein leptin-E100. Although regulation of fat stores is deemed to be the primary function of leptin, it also plays a role in other physiological processes , as evidenced by its many sites of synthesis other than fat cells, and the many cell types beside hypothalamic cells that have leptin receptors. Many of these additional functions are yet to be defined. Predominantly, the "energy expenditure hormone" leptin is made by adipose cells, thus it is labeled fat cell-specific. In the context of its effects, it is important to recognize that the short describing words direct, central, and primary are not used interchangeably. In regard to the hormone leptin, central vs peripheral refers to the hypothalamic portion of the brain vs non-hypothalamic location of action of leptin; direct vs indirect refers to whether there is no intermediary, or there is an intermediary in the mode of action of leptin; and primary vs secondary is an arbitrary description of a particular function of leptin. Leptin acts directly on leptin receptors in the cell membrane of different types of cells in the human body in particular, and in vertebrates in general. The leptin receptor is found on a wide range of cell types. It is a single-transmembrane-domain type I cytokine receptor, a special class of cytokine receptors. Further, leptin interacts with other hormones and energy regulators, indirectly mediating the effects of: insulin, glucagon, insulin-like growth factor, growth hormone, glucocorticoids, cytokines, and metabolites. The central location of action (effect) of the fat cell-specific hormone leptin is the hypothalamus, a part of the brain, which is a part of the central nervous system. Non-hypothalamic targets of leptin are referred to as peripheral targets. There is a different relative importance of central and peripheral leptin interactions under different physiologic states, and variations between species. The primary function of the hormone leptin is the regulation of adipose tissue mass through central hypothalamus mediated effects on hunger, food energy use, physical exercise and energy balance. Outside the brain, in the periphery of the body, leptin's secondary functions are: modulation of energy expenditure, modulation between fetal and maternal metabolism, and that of a permissive factor in puberty, activator of immune cells, activator of beta islet cells, and growth factor. In vertebrates, the nervous system consists of two main parts, the central nervous system (CNS) and the peripheral nervous system (PNS). The primary effect of leptins is in the hypothalamus, a part of the central nervous system. Leptin receptors are expressed not only in the hypothalamus but also in other brain regions, particularly in the hippocampus. Thus some leptin receptors in the brain are classified as central (hypothalamic) and some as peripheral (non-hypothalamic). Deficiency of leptin has been shown to alter brain proteins and neuronal functions of obese mice which can be restored by leptin injection. In humans, low circulating plasma leptin has been associated with cognitive changes associated with anorexia, depression, and Alzheimer’s Disease . Studies in transgenic mouse models of Alzheimer's disease have shown that chronic administration of leptin can ameliorate brain pathology and improve cognitive performance, by reducing b-amyloid and hyperphosphorylated Tau, two hallmarks of Alzheimer's pathology. Generally, leptin is thought to enter the brain at the choroid plexus, where the intense expression of a form of leptin receptor molecule could act as a transport mechanism. Increased levels of melatonin causes a downregulation of leptin, however, melatonin also appears to increase leptin levels in the presence of insulin, therefore causing a decrease in appetite during sleeping. Partial sleep deprivation has also been associated with decreased leptin levels. Mice with type 1 diabetes treated with leptin or leptin plus insulin, compared to insulin alone had better metabolic profiles: blood sugar did not fluctuate so much; cholesterol levels decreased; less body fat formed. Leptin acts on receptors in the lateral hypothalamus to inhibit hunger and the medial hypothalamus to stimulate satiety. Thus, a lesion in the lateral hypothalamus causes anorexia (due to a lack of hunger signals) and a lesion in the medial hypothalamus causes excessive hunger (due to a lack of satiety signals). This appetite inhibition is long-term, in contrast to the rapid inhibition of hunger by cholecystokinin (CCK) and the slower suppression of hunger between meals mediated by PYY3-36. The absence of leptin (or its receptor) leads to uncontrolled hunger and resulting obesity. Fasting or following a very-low-calorie diet lowers leptin levels. Leptin levels change more when food intake decreases than when it increases. The dynamics of leptin due to an acute change in energy balance may be related to appetite and eventually, to food intake rather than fat stores. It controls food intake and energy expenditure by acting on receptors in the mediobasal hypothalamus. Leptin binds to neuropeptide Y (NPY) neurons in the arcuate nucleus in such a way as to decrease the activity of these neurons. Leptin signals to the hypothalamus which produces a feeling of satiety. Moreover, leptin signals may make it easier for people to resist the temptation of foods high in calories. Leptin receptor activation inhibits neuropeptide Y and agouti-related peptide (AgRP), and activates α-melanocyte-stimulating hormone (α-MSH). The NPY neurons are a key element in the regulation of hunger; small doses of NPY injected into the brains of experimental animals stimulates feeding, while selective destruction of the NPY neurons in mice causes them to become anorexic. Conversely, α-MSH is an important mediator of satiety, and differences in the gene for the α-MSH receptor are linked to obesity in humans. Leptin interacts with six types of receptors (Ob-Ra–Ob-Rf, or LepRa-LepRf), which in turn are encoded by a single gene, LEPR. Ob-Rb is the only receptor isoform that can signal intracellularly via the Jak-Stat and MAPK signal transduction pathways, and is present in hypothalamic nuclei. Once leptin has bound to the Ob-Rb receptor, it activates the stat3, which is phosphorylated and travels to the nucleus to effect changes in gene expression, one of the main effects being the down-regulation of the expression of endocannabinoids, responsible for increasing hunger. In response to leptin, receptor neurons have been shown to remodel themselves, changing the number and types of synapses that fire onto them. The role of leptin/leptin receptors in modulation of T cell activity in the immune system was shown in experimentation with mice. It modulates the immune response to atherosclerosis, of which obesity is a predisposing factor. Exogenous leptin can promote angiogenesis by increasing vascular endothelial growth factor levels. Hyperleptinemia produced by infusion or adenoviral gene transfer decreases blood pressure in rats. Leptin microinjections into the nucleus of the solitary tract (NTS) have been shown to elicit sympathoexcitatory responses, and potentiate the cardiovascular responses to activation of the chemoreflex. In fetal lung, leptin is induced in the alveolar interstitial fibroblasts ("lipofibroblasts") by the action of PTHrP secreted by formative alveolar epithelium (endoderm) under moderate stretch. The leptin from the mesenchyme, in turn, acts back on the epithelium at the leptin receptor carried in the alveolar type II pneumocytes and induces surfactant expression, which is one of the main functions of these type II pneumocytes. In mice, and to a lesser extent in humans, leptin is required for male and female fertility. Ovulatory cycles in females are linked to energy balance (positive or negative depending on whether a female is losing or gaining weight) and energy flux (how much energy is consumed and expended) much more than energy status (fat levels). When energy balance is highly negative (meaning the woman is starving) or energy flux is very high (meaning the woman is exercising at extreme levels, but still consuming enough calories), the ovarian cycle stops and females stop menstruating. Only if a female has an extremely low body fat percentage does energy status affect menstruation. Leptin levels outside an ideal range may have a negative effect on egg quality and outcome during in vitro fertilization. Leptin is involved in reproduction by stimulating gonadotropin-releasing hormone from the hypothalamus. The placenta produces leptin. Leptin levels rise during pregnancy and fall after childbirth. Leptin is also expressed in fetal membranes and the uterine tissue. Uterine contractions are inhibited by leptin. Leptin plays a role in hyperemesis gravidarum (severe morning sickness of pregnancy), in polycystic ovary syndrome and hypothalamic leptin is implicated in bone growth in mice. Immunoreactive leptin has been found in human breast milk; and leptin from mother's milk has been found in the blood of suckling infant animals. Leptin along with kisspeptin controls the onset of puberty. High levels of leptin, as usually observed in obese females, can trigger neuroendocrine cascade resulting in early menarche. This may eventually lead to shorter stature as oestrogen secretion starts during menarche and causes early closure of epiphyses. Leptin's ability to regulate bone mass was first recognized in 2000. Leptin can affect bone metabolism via direct signalling from the brain. Leptin decreases cancellous bone, but increases cortical bone. This "cortical-cancellous dichotomy" may represent a mechanism for enlarging bone size, and thus bone resistance, to cope with increased body weight. Bone metabolism can be regulated by central sympathetic outflow, since sympathetic pathways innervate bone tissue. A number of brain-signalling molecules (neuropeptides and neurotransmitters) have been found in bone, including adrenaline, noradrenaline, serotonin, calcitonin gene-related peptide, vasoactive intestinal peptide and neuropeptide Y. Leptin binds to its receptors in the hypothalamus, where it acts through the sympathetic nervous system to regulate bone metabolism. Leptin may also act directly on bone metabolism via a balance between energy intake and the IGF-I pathway. There is a potential for treatment of diseases of bone formation - such as impaired fracture healing - with leptin. Factors that acutely affect leptin levels are also factors that influence other markers of inflammation, e.g., testosterone, sleep, emotional stress, caloric restriction, and body fat levels. While it is well-established that leptin is involved in the regulation of the inflammatory response, it has been further theorized that leptin's role as an inflammatory marker is to respond specifically to adipose-derived inflammatory cytokines. In terms of both structure and function, leptin resembles IL-6 and is a member of the cytokine superfamily. Circulating leptin seems to affect the HPA axis, suggesting a role for leptin in stress response. Elevated leptin concentrations are associated with elevated white blood cell counts in both men and women. Similar to what is observed in chronic inflammation, chronically elevated leptin levels are associated with obesity, overeating, and inflammation-related diseases, including hypertension, metabolic syndrome, and cardiovascular disease. While leptin is associated with body fat mass, however, the size of individual fat cells, and the act of overeating, it is interesting that it is not affected by exercise (for comparison, IL-6 is released in response to muscular contractions). Thus, it is speculated that leptin responds specifically to adipose-derived inflammation. Leptin is a pro-angiogenic, pro-inflammatory and mitogenic factor, the actions of which are reinforced through crosstalk with IL-1 family cytokines in cancer. Taken as such, increases in leptin levels (in response to caloric intake) function as an acute pro-inflammatory response mechanism to prevent excessive cellular stress induced by overeating. When high caloric intake overtaxes the ability of fat cells to grow larger or increase in number in step with caloric intake, the ensuing stress response leads to inflammation at the cellular level and ectopic fat storage, i.e., the unhealthy storage of body fat within internal organs, arteries, and/or muscle. The insulin increase in response to the caloric load provokes a dose-dependent rise in leptin, an effect potentiated by high cortisol levels. (This insulin-leptin relationship is notably similar to insulin's effect on the increase of IL-6 gene expression and secretion from preadipocytes in a time- and dose-dependent manner.) Furthermore, plasma leptin concentrations have been observed to gradually increase when acipimox is administered to prevent lipolysis, concurrent hypocaloric dieting and weight loss notwithstanding. Such findings appear to demonstrate high caloric loads in excess of storage rate capacities of fat cells lead to stress responses that induce an increase in leptin, which then operates as an adipose-derived inflammation stopgap signaling for the cessation of food intake so as to prevent adipose-derived inflammation from reaching elevated levels. This response may then protect against the harmful process of ectopic fat storage, which perhaps explains the connection between chronically elevated leptin levels and ectopic fat storage in obese individuals. The Ob(Lep) gene (Ob for obese, Lep for leptin) is located on chromosome 7 in humans. Human leptin is a 16-kDa protein of 167 amino acids. A human mutant leptin was first described in 1997, and subsequently six additional mutations were described. All of those affected were from Eastern countries; and all had variants of leptin not detected by the standard immunoreactive technique, so leptin levels were low or undetectable. The most recently described eighth mutation reported in January 2015, in a child with Turkish parents, is unique in that it is detected by the standard immunoreactive technique, where leptin levels are elevated; but the leptin does not turn on the leptin receptor, hence the patient has functional leptin deficiency. These eight mutations all cause extreme obesity in infancy, with hyperphagia. A nonsense mutation in the leptin gene that results in a stop codon and lack of leptin production was first observed in mice in 1950. In the mouse gene, arginine-105 is encoded by CGA and only requires one nucleotide change to create the stop codon TGA. The corresponding amino acid in humans is encoded by the sequence CGG and would require two nucleotides to be changed to produce a stop codon, which is much less likely to happen. A recessive frameshift mutation resulting in a reduction of leptin has been observed in two consanguineous children with juvenile obesity. A 2001 study of 13 people with a heterozygous frameshift mutation known as delta-G133 found that they had lower blood leptin levels than controls. There was an increased rate of obesity in these individuals, with 76% having a BMI of over 30 compared to 26% in the control group. A Human Genome Equivalent (HuGE) review in 2004 looked at studies of the connection between genetic mutations affecting leptin regulation and obesity. They reviewed a common polymorphism in the leptin gene (A19G; frequency 0.46), three mutations in the leptin receptor gene (Q223R, K109R and K656N) and two mutations in the PPARG gene (P12A and C161T). They found no association between any of the polymorphisms and obesity. A 2006 study found a link between the common LEP-2548 G/A genotype and morbid obesity in Taiwanese aborigines, but a 2014 meta-analysis did not, however, this polymorphism has been associated with weight gain in patients taking antipsychotics. The LEP-2548 G/A polymorphism has been linked with an increased risk of prostate cancer, gestational diabetes, and osteoporosis. Other rare polymorphisms have been found but their association with obesity are not consistent. A single case of a homozygous transversion mutation of the gene encoding for leptin was reported in January 2015. It leads to functional leptin deficiency with high leptin levels in circulation. The transversion of (c.298G → T) changed aspartic acid to tyrosine at position 100 (p.D100Y). The mutant leptin could neither bind to nor activate the leptin receptor in vitro, nor in leptin-deficient mice in vivo. It was found in a two-year-old boy with extreme obesity with recurrent ear and pulmonary infections. Treatment with metreleptin led to "rapid change in eating behavior, a reduction in daily energy intake, and substantial weight loss." Leptin is produced primarily in the adipocytes of white adipose tissue. It also is produced by brown adipose tissue, placenta (syncytiotrophoblasts), ovaries, skeletal muscle, stomach (the lower part of the fundic glands), mammary epithelial cells, bone marrow,gastric chief cells and P/D1 cells. 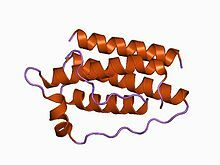 Leptin circulates in blood in free form and bound to proteins. Leptin levels vary exponentially, not linearly, with fat mass. Leptin levels in blood are higher between midnight and early morning, perhaps suppressing appetite during the night. The diurnal rhythm of blood leptin levels may be modified by meal-timing. Leptin plays a critical role in the adaptive response to starvation. Leptin level is decreased after short-term fasting (24–72 hours), even when changes in fat mass are not observed. Serum level of leptin is reduced by sleep deprivation. Leptin levels are paradoxically increased in obesity. Leptin level is increased by emotional stress. Leptin level is chronically reduced by physical exercise training. Leptin level is decreased by increases in testosterone levels and increased by increases in estrogen levels. Leptin level is increased by insulin. Leptin release is increased by dexamethasone. In obese patients with obstructive sleep apnea, leptin level is increased, but decreased after the administration of continuous positive airway pressure. In non-obese individuals, however, restful sleep (i.e., 8–12 hours of unbroken sleep) can increase leptin to normal levels. All known leptin mutations except one are associated with low to undetectable immunoreactive leptin blood levels. The exception is a mutant leptin reported in January 2015 which is not functional, but is detected with standard immunoreactive methods. It was found in a massively obese 2-1/2-year-old boy who had high levels of circulating leptin which had no effect on leptin receptors, so he was functionally leptin-deficient. Although leptin reduces appetite as a circulating signal, obese individuals generally exhibit a higher circulating concentration of leptin than normal weight individuals due to their higher percentage body fat. These people show resistance to leptin, similar to resistance of insulin in type 2 diabetes, with the elevated levels failing to control hunger and modulate their weight. A number of explanations have been proposed to explain this. An important contributor to leptin resistance is changes to leptin receptor signalling, particularly in the arcuate nucleus, however, deficiency of, or major changes to, the leptin receptor itself are not thought to be a major cause. Other explanations suggested include changes to the way leptin crosses the blood brain barrier (BBB) or alterations occurring during development. Studies on leptin cerebrospinal fluid (CSF) levels provide evidence for the reduction in leptin crossing the BBB and reaching obesity-relevant targets, such as the hypothalamus, in obese people. In humans it has been observed that the ratio of leptin in the CSF compared to the blood is lower in obese people than in people of a normal weight. The reason for this may be high levels of triglycerides affecting the transport of leptin across the BBB or due to the leptin transporter becoming saturated. Although deficits in the transfer of leptin from the plasma to the CSF is seen in obese people, they are still found to have 30% more leptin in their CSF than lean individuals. These higher CSF levels fail to prevent their obesity. Since the amount and quality of leptin receptors in the hypothalamus appears to be normal in the majority of obese humans (as judged from leptin-mRNA studies), it is likely that the leptin resistance in these individuals is due to a post leptin-receptor deficit, similar to the post-insulin receptor defect seen in type 2 diabetes. When leptin binds with the leptin receptor, it activates a number of pathways. Leptin resistance may be caused by defects in one or more part of this process, particularly the JAK/STAT pathway. Mice with a mutation in the leptin receptor gene that prevents the activation of STAT3 are obese and exhibit hyperphagia. The PI3K pathway may also be involved in leptin resistance, as has been demonstrated in mice by artificial blocking of PI3K signalling. The PI3K pathway also is activated by the insulin receptor and is therefore an important area where leptin and insulin act together as part of energy homeostasis. The insulin-pI3K pathway can cause POMC neurons to become insensitive to leptin through hyperpolarization. The consumption of a high fructose diet from birth has been associated with a reduction in leptin levels and reduced expression of leptin receptor mRNA in rats. Long-term consumption of fructose in rats has been shown to increase levels of triglycerides and trigger leptin and insulin resistance, however, another study found that leptin resistance only developed in the presence of both high fructose and high fat levels in the diet. A third study found that high fructose levels reversed leptin resistance in rats given a high fat diet. The contradictory results mean that it is uncertain whether leptin resistance is caused by high levels of carbohydrates or fats, or if an increase of both, is needed. Leptin is known to interact with amylin, a hormone involved in gastric emptying and creating a feeling of fullness. When both leptin and amylin were given to obese, leptin-resistant rats, sustained weight loss was seen. Due to its apparent ability to reverse leptin resistance, amylin has been suggested as possible therapy for obesity. It has been suggested that the main role of leptin is to act as a starvation signal when levels are low, to help maintain fat stores for survival during times of starvation, rather than a satiety signal to prevent overeating. Leptin levels signal when an animal has enough stored energy to spend it in pursuits besides acquiring food. This would mean that leptin resistance in obese people is a normal part of mammalian physiology and possibly, could confer a survival advantage. Leptin resistance (in combination with insulin resistance and weight gain) is seen in rats after they are given unlimited access to palatable, energy-dense foods. This effect is reversed when the animals are put back on a low-energy diet. This also may have an evolutionary advantage: allowing energy to be stored efficiently when food is plentiful would be advantageous in populations where food frequently may be scarce. Dieters who lose weight, particularly those with an overabundance of fat cells, experience a drop in levels of circulating leptin. This drop causes reversible decreases in thyroid activity, sympathetic tone, and energy expenditure in skeletal muscle, and increases in muscle efficiency and parasympathetic tone. Many of these changes are reversed by peripheral administration (⁠ ⁠intravenously into the veins of the arms, hands, legs, or feet⁠ ⁠) of recombinant leptin to restore pre-diet levels. A decline in levels of circulating leptin also changes brain activity in areas involved in the regulatory, emotional, and cognitive control of appetite that are reversed by administration of leptin. Osteoarthritis and obesity are closely linked. Obesity is one of the most important preventable factors for the development of osteoarthritis. Originally, the relationship between osteoarthritis and obesity was considered to be exclusively biomechanically based, according to which the excess weight caused the joint to become worn down more quickly. However, today we recognise that there is also a metabolic component which explains why obesity is a risk factor for osteoarthritis, not only for weight-bearing joints (for example, the knees), but also for joints that do not bear weight (for example, the hands). Consequently, it has been shown that decreasing body fat lessens osteoarthritis to a greater extent than weight loss per se. This metabolic component related with the release of systemic factors, of a pro-inflammatory nature, by the adipose tissues, which frequently are critically associated with the development of osteoarthritis. Thus, the deregulated production of adipokines and inflammatory mediators, hyperlipidaemia, and the increase of systemic oxidative stress are conditions frequently associated with obesity which can favour joint degeneration. Furthermore, many regulation factors have been implicated in the development, maintenance and function, both of adipose tissues, as well as of the cartilage and other joint tissues. Alterations in these factors can be the additional link between obesity and osteoarthritis. Adipocytes interact with other cells through producing and secreting a variety of signalling molecules, including the cell signalling proteins known as adipokines. Certain adipokines can be considered as hormones, as they regulate the functions of organs at a distance, and several of them have been specifically involved in the physiopathology of joint diseases. In particular, there is one, leptin, which has been the focus of attention for research in recent years. The circulating leptin levels are positively correlated with the Body Mass Index (BMI), more specifically with fatty mass, and obese individuals have higher leptin levels in their blood circulation, compared with non-obese individuals. In obese individuals, the increased circulating leptin levels induce unwanted responses, that is, reduced food intake or losing body weight does not occur as there is a resistance to leptin (ref 9). In addition to the function of regulating energy homeostasis, leptin carries out a role in other physiological functions such as neuroendocrine communication, reproduction, angiogenesis and bone formation. More recently, leptin has been recognised as a cytokine factor as well as with pleiotropic actions also in the immune response and inflammation. For example, leptin can be found in the synovial fluid in correlation with the body mass index, and the leptin receptors are expressed in the cartilage, where leptin mediates and modulates many inflammatory responses that can damage cartilage and other joint tissues. Leptin has thus emerged as a candidate to link obesity and osteoarthritis and serves as an apparent objective as a nutritional treatment for osteoarthritis. There are nutritional supplements and pharmacological agents capable of directing these factors and improving both conditions. Leptin was approved in the United States in 2014 for use in congenital leptin deficiency and generalized lipodystrophy. An analog of human leptin metreleptin (trade names Myalept, Myalepta) was first approved in Japan in 2013, and in the United States in February 2014 and in Europe in 2018. In the US it is indicated as a treatment for complications of leptin deficiency, and for the diabetes and hypertriglyceridemia associated with congenital or acquired generalized lipodystrophy. In Europe based on EMA, metreleptin should be used in addition to diet to treat lipodystrophy, where patients have loss of fatty tissue under the skin and build-up of fat elsewhere in the body such as in the liver and muscles. The medicine is used in adults and children above the age of 2 years with generalised lipodystrophy (Berardinelli-Seip syndrome and Lawrence syndrome); and in adults and children above the age of 12 years with partial lipodystrophy (including Barraquer-Simons syndrome), when standard treatments have failed. In 1949, a non-obese mouse colony being studied at the Jackson Laboratory produced a strain of obese offspring, suggesting that a mutation had occurred in a hormone regulating hunger and energy expenditure. Mice homozygous for the so-called ob mutation (ob/ob) ate voraciously and were massively obese. In the 1960s, a second mutation causing obesity and a similar phenotype was identified by Douglas Coleman, also at the Jackson Laboratory, and was named diabetes (db), as both ob/ob and db/db were obese. In 1990 Rudolph Leibel and Jeffrey M. Friedman reported mapping of the db gene. Consistent with Coleman’s and Leibel's hypothesis, several subsequent studies from Leibel's and Friedman’s labs and other groups confirmed that the ob gene encoded a novel hormone that circulated in blood and that could suppress food intake and body weight in ob and wild type mice, but not in db mice. In 1994, Friedman's laboratory reported the identification of the gene. In 1995, Jose F. Caro's laboratory provided evidence that the mutations in the mouse ob gene did not occur in humans. Furthermore, since ob gene expression was increased, not decreased, in human obesity, it suggested resistance to leptin to be a possibility. At the suggestion of Roger Guillemin, Friedman named this new hormone "leptin" from the Greek lepto meaning thin. Leptin was the first fat cell-derived hormone (adipokine) to be discovered. Subsequent studies in 1995 confirmed that the db gene encodes the leptin receptor, and that it is expressed in the hypothalamus, a region of the brain known to regulate the sensation of hunger and body weight. Coleman and Friedman have been awarded numerous prizes acknowledging their roles in discovery of leptin, including the Gairdner Foundation International Award (2005), the Shaw Prize (2009), the Lasker Award, the BBVA Foundation Frontiers of Knowledge Award and the King Faisal International Prize, Leibel has not received the same level of recognition from the discovery because he was omitted as a co-author of a scientific paper published by Friedman that reported the discovery of the gene. The various theories surrounding Friedman’s omission of Leibel and others as co-authors of this paper have been presented in a number of publications, including Ellen Ruppel Shell’s 2002 book The Hungry Gene. The discovery of leptin also is documented in a series of books including Fat: Fighting the Obesity Epidemic by Robert Pool, The Hungry Gene by Ellen Ruppel Shell, and Rethinking Thin: The New Science of Weight Loss and the Myths and Realities of Dieting by Gina Kolata. Fat: Fighting the Obesity Epidemic and Rethinking Thin: The New Science of Weight Loss and the Myths and Realities of Dieting review the work in the Friedman laboratory that led to the cloning of the ob gene, while The Hungry Gene draws attention to the contributions of Leibel. ^ a b Zhang F, Basinski MB, Beals JM, Briggs SL, Churgay LM, Clawson DK, DiMarchi RD, Furman TC, Hale JE, Hsiung HM, Schoner BE, Smith DP, Zhang XY, Wery JP, Schevitz RW (May 1997). 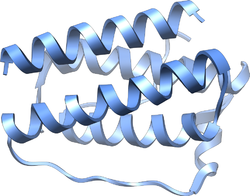 "Crystal structure of the obese protein leptin-E100". Nature. 387 (6629): 206–09. Bibcode:1997Natur.387..206Z. doi:10.1038/387206a0. PMID 9144295. ^ Brennan AM, Mantzoros CS (2006). "Drug Insight: the role of leptin in human physiology and pathophysiology – emerging clinical applications". Nat Clin Pract Endocrinol Metab. 2 (6): 318–27. doi:10.1038/ncpendmet0196. PMID 16932309. ^ Pan H, Guo J, Su Z (May 2014). "Advances in understanding the interrelations between leptin resistance and obesity". Physiology & Behavior. 130: 157–69. doi:10.1016/j.physbeh.2014.04.003. PMID 24726399. ^ Article in "Mammalian Biology"
^ a b c Halaas JL, Gajiwala KS, Maffei M, Cohen SL, Chait BT, Rabinowitz D, Lallone RL, Burley SK, Friedman JM (July 1995). "Weight-reducing effects of the plasma protein encoded by the obese gene". Science. 269 (5223): 543–46. Bibcode:1995Sci...269..543H. doi:10.1126/science.7624777. PMID 7624777. ^ a b Campfield LA, Smith FJ, Guisez Y, Devos R, Burn P (July 1995). "Recombinant mouse OB protein: evidence for a peripheral signal linking adiposity and central neural networks". Science. 269 (5223): 546–49. Bibcode:1995Sci...269..546C. doi:10.1126/science.7624778. PMID 7624778. ^ a b Pelleymounter MA, Cullen MJ, Baker MB, Hecht R, Winters D, Boone T, Collins F (July 1995). "Effects of the obese gene product on body weight regulation in ob/ob mice". Science. 269 (5223): 540–43. Bibcode:1995Sci...269..540P. doi:10.1126/science.7624776. PMID 7624776. ^ a b Maffei M, Halaas J, Ravussin E, Pratley RE, Lee GH, Zhang Y, Fei H, Kim S, Lallone R, Ranganathan S (November 1995). "Leptin levels in human and rodent: measurement of plasma leptin and ob RNA in obese and weight-reduced subjects". Nat. Med. 1 (11): 1155–61. doi:10.1038/nm1195-1155. PMID 7584987. ^ a b c Considine RV, Considine EL, Williams CJ, Nyce MR, Magosin SA, Bauer TL, Rosato EL, Colberg J, Caro JF (June 1995). "Evidence against either a premature stop codon or the absence of obese gene mRNA in human obesity". J. Clin. Invest. 95 (6): 2986–88. doi:10.1172/JCI118007. PMC 295988. PMID 7769141. ^ a b c Considine RV, Sinha MK, Heiman ML, Kriauciunas A, Stephens TW, Nyce MR, Ohannesian JP, Marco CC, McKee LJ, Bauer TL (1996). "Serum immunoreactive-leptin concentrations in normal-weight and obese humans". N. Engl. J. Med. 334 (5): 292–95. doi:10.1056/NEJM199602013340503. PMID 8532024. ^ Mantzoros CS (1999). "The role of leptin in human obesity and disease: a review of current evidence". Ann. Intern. Med. 130 (8): 671–80. doi:10.7326/0003-4819-130-8-199904200-00014. PMID 10215564. ^ Cirillo D, Rachiglio AM, la Montagna R, Giordano A, Normanno N (2008). "Leptin signaling in breast cancer: an overview". Journal of Cellular Biochemistry. 105 (4): 956–64. doi:10.1002/jcb.21911. PMID 18821585. ^ a b c Margetic S, Gazzola C, Pegg GG, Hill RA (2002). "Leptin: a review of its peripheral actions and interactions". Int. J. Obes. Relat. Metab. Disord. 26 (11): 1407–33. doi:10.1038/sj.ijo.0802142. PMID 12439643. ^ Farr SA, Banks WA, Morley JE (June 2006). "Effects of leptin on memory processing". Peptides. 27 (6): 1420–25. doi:10.1016/j.peptides.2005.10.006. PMID 16293343. ^ Casanueva FF, Dieguez C, Popovic V, Peino R, Considine RV, Caro JF (April 1997). "Serum immunoreactive leptin concentrations in patients with anorexia nervosa before and after partial weight recovery". Biochem. Mol. Med. 60 (2): 116–20. doi:10.1006/bmme.1996.2564. PMID 9169091. ^ Lieb W, Beiser AS, Vasan RS, Tan ZS, Au R, Harris TB, Roubenoff R, Auerbach S, DeCarli C, Wolf PA, Seshadri S (December 2009). "Association of plasma leptin levels with incident Alzheimer disease and MRI measures of brain aging". JAMA. 302 (23): 2565–72. doi:10.1001/jama.2009.1836. PMC 2838501. PMID 20009056. ^ Greco SJ, Bryan KJ, Sarkar S, Zhu X, Smith MA, Ashford JW, Johnston JM, Tezapsidis N, Casadesus G (2010). "Leptin reduces pathology and improves memory in a transgenic mouse model of Alzheimer's disease". J. Alzheimers Dis. 19 (4): 1155–67. doi:10.3233/JAD-2010-1308. PMC 2862270. PMID 20308782. ^ Doherty GH, Beccano-Kelly D, Yan SD, Gunn-Moore FJ, Harvey J (January 2013). "Leptin prevents hippocampal synaptic disruption and neuronal cell death induced by amyloid β". Neurobiol. Aging. 34 (1): 226–37. doi:10.1016/j.neurobiolaging.2012.08.003. PMID 22921154. ^ Greco SJ, Sarkar S, Johnston JM, Tezapsidis N (February 2009). "Leptin regulates tau phosphorylation and amyloid through AMPK in neuronal cells". Biochem. Biophys. Res. Commun. 380 (1): 98–104. doi:10.1016/j.bbrc.2009.01.041. PMC 2657956. PMID 19166821. ^ Lynn RB, Cao GY, Considine RV, Hyde TM, Caro JF (February 1996). "Autoradiographic localization of leptin binding in the choroid plexus of ob/ob and db/db mice". Biochem. Biophys. Res. Commun. 219 (3): 884–89. doi:10.1006/bbrc.1996.0328. PMID 8645274. ^ Kus I, Sarsilmaz M, Colakoglu N, Kukne A, Ozen OA, Yilmaz B, Kelestimur H (2004). "Pinealectomy increases and exogenous melatonin decreases leptin production in rat anterior pituitary cells: an immunohistochemical study". Physiol Res. 53 (4): 403–08. PMID 15311999. ^ Alonso-Vale MI, Andreotti S, Peres SB, Anhê GF, das Neves Borges-Silva C, Neto JC, Lima FB (April 2005). "Melatonin enhances leptin expression by rat adipocytes in the presence of insulin". Am. J. Physiol. Endocrinol. Metab. 288 (4): E805–12. doi:10.1152/ajpendo.00478.2004. PMID 15572654. ^ Copinschi G (2005). "Metabolic and endocrine effects of sleep deprivation". Essential Psychopharmacology. 6 (6): 341–47. PMID 16459757. ^ Wang MY, Chen L, Clark GO, Lee Y, Stevens RD, Ilkayeva OR, Wenner BR, Bain JR, Charron MJ, Newgard CB, Unger RH (March 2010). "Leptin therapy in insulin-deficient type I diabetes". Proc. Natl. Acad. Sci. USA. 107 (11): 4813–19. Bibcode:2010PNAS..107.4813W. doi:10.1073/pnas.0909422107. PMC 2841945. PMID 20194735. Lay summary – medicinenet.com. ^ a b Elmquist JK, Elias CF, Saper CB (Feb 1999). "From lesions to leptin: hypothalamic control of food intake and body weight". Neuron. 22 (2): 221–32. doi:10.1016/S0896-6273(00)81084-3. PMID 10069329. ^ Elias CF, Aschkenasi C, Lee C, Kelly J, Ahima RS, Bjorbaek C, Flier JS, Saper CB, Elmquist JK (Aug 1999). "Leptin differentially regulates NPY and POMC neurons projecting to the lateral hypothalamic area". Neuron. 23 (4): 775–86. doi:10.1016/S0896-6273(01)80035-0. PMID 10482243. ^ Fekete C, Légrádi G, Mihály E, Huang QH, Tatro JB, Rand WM, Emerson CH, Lechan RM (Feb 2000). "alpha-Melanocyte-stimulating hormone is contained in nerve terminals innervating thyrotropin-releasing hormone-synthesizing neurons in the hypothalamic paraventricular nucleus and prevents fasting-induced suppression of prothyrotropin-releasing hormone gene expression". The Journal of Neuroscience. 20 (4): 1550–58. doi:10.1523/JNEUROSCI.20-04-01550.2000. PMID 10662844. ^ Dubuc GR, Phinney SD, Stern JS, Havel PJ (1998). "Changes of serum leptin and endocrine and metabolic parameters after 7 days of energy restriction in men and women". Metab. Clin. Exp. 47 (4): 429–34. doi:10.1016/S0026-0495(98)90055-5. PMID 9550541. ^ Pratley RE, Nicolson M, Bogardus C, Ravussin E (1997). "Plasma leptin responses to fasting in Pima Indians". Am. J. Physiol. 273 (3 Pt 1): E644–49. doi:10.1152/ajpendo.1997.273.3.E644. PMID 9316457. ^ Weigle DS, Duell PB, Connor WE, Steiner RA, Soules MR, Kuijper JL (February 1997). "Effect of fasting, refeeding, and dietary fat restriction on plasma leptin levels". J. Clin. Endocrinol. Metab. 82 (2): 561–65. doi:10.1210/jc.82.2.561. PMID 9024254. ^ Wadden TA, Considine RV, Foster GD, Anderson DA, Sarwer DB, Caro JS (January 1998). "Short- and long-term changes in serum leptin dieting obese women: effects of caloric restriction and weight loss". J. Clin. Endocrinol. Metab. 83 (1): 214–18. doi:10.1210/jcem.83.1.4494. PMID 9435444. ^ Chin-Chance C, Polonsky KS, Schoeller DA (2000). "Twenty-four-hour leptin levels respond to cumulative short-term energy imbalance and predict subsequent intake". J. Clin. Endocrinol. Metab. 85 (8): 2685–91. doi:10.1210/jc.85.8.2685. PMID 10946866. ^ Keim NL, Stern JS, Havel PJ (1998). "Relation between circulating leptin concentrations and appetite during a prolonged, moderate energy deficit in women". Am. J. Clin. Nutr. 68 (4): 794–801. doi:10.1093/ajcn/68.4.794. PMID 9771856. ^ Mars M, de Graaf C, de Groot CP, van Rossum CT, Kok FJ (2006). "Fasting leptin and appetite responses induced by a 4-day 65%-energy-restricted diet". International Journal of Obesity (Lond). 30 (1): 122–28. doi:10.1038/sj.ijo.0803070. PMID 16158086. ^ Williams KW, Scott MM, Elmquist JK (March 2009). "From observation to experimentation: leptin action in the mediobasal hypothalamus". Am. J. Clin. Nutr. 89 (3): 985S–90S. doi:10.3945/ajcn.2008.26788D. PMC 2667659. PMID 19176744. ^ Baicy K, London ED, Monterosso J, Wong ML, Delibasi T, Sharma A, Licinio J (November 2007). "Leptin replacement alters brain response to food cues in genetically leptin-deficient adults". Proc. Natl. Acad. Sci. USA. 104 (46): 18276–79. Bibcode:2007PNAS..10418276B. doi:10.1073/pnas.0706481104. PMC 2084333. PMID 17986612. Lay summary – WebMD. ^ Wang MY, Zhou YT, Newgard CB, Unger RH (August 1996). "A novel leptin receptor isoform in rat". FEBS Lett. 392 (2): 87–90. doi:10.1016/0014-5793(96)00790-9. PMID 8772180. ^ Malendowicz W, Rucinski M, Macchi C, Spinazzi R, Ziolkowska A, Nussdorfer GG, Kwias Z (October 2006). "Leptin and leptin receptors in the prostate and seminal vesicles of the adult rat". Int. J. Mol. Med. 18 (4): 615–18. doi:10.3892/ijmm.18.4.615. PMID 16964413. ^ "LepRb antibody (commercial site)". ^ Di Marzo V (2008). "The endocannabinoid system in obesity and type 2 diabetes". Diabetologia. 51 (8): 1356–67. doi:10.1007/s00125-008-1048-2. PMID 18563385. ^ Taleb S, Herbin O, Ait-Oufella H, Verreth W, Gourdy P, Barateau V, Merval R, Esposito B, Clément K, Holvoet P, Tedgui A, Mallat Z (2007). "Defective leptin/leptin receptor signaling improves regulatory T cell immune response and protects mice from atherosclerosis". Arterioscler Thromb Vasc Biol. 27 (12): 2691–98. doi:10.1161/ATVBAHA.107.149567. PMID 17690315. ^ Zhang W, Telemaque S, Augustyniak RA, Anderson P, Thomas GD, An J, Wang Z, Newgard CB, Victor RG (2010). "Adenovirus-mediated leptin expression normalises hypertension associated with diet-induced obesity". J Neuroendocrinol. 22 (3): 175–80. doi:10.1111/j.1365-2826.2010.01953.x. PMID 20059648. ^ Knight WD, Seth R, Boron J, Overton JM (2009). "Short-term physiological hyperleptinemia decreases arterial blood pressure". Regul Pept. 154 (1–3): 60–68. doi:10.1016/j.regpep.2009.02.001. PMID 19323984. ^ Ciriello J, Moreau JM (November 2012). "Systemic administration of leptin potentiates the response of neurons in the nucleus of the solitary tract to chemoreceptor activation in the rat". Journal of Neuroscience. 229: 88–99. doi:10.1016/j.neuroscience.2012.10.065. PMID 23159310. ^ Torday JS, Rehan VK (October 2006). "Up-regulation of fetal rat lung parathyroid hormone-related protein gene regulatory network down-regulates the Sonic Hedgehog/Wnt/beta-catenin gene regulatory network". Pediatr. Res. 60 (4): 382–88. doi:10.1203/01.pdr.0000238326.42590.03. PMID 16940239. ^ Anifandis G, Koutselini E, Louridas K, Liakopoulos V, Leivaditis K, Mantzavinos T, Sioutopoulou D, Vamvakopoulos N (April 2005). "Estradiol and leptin as conditional prognostic IVF markers". Reproduction. 129 (4): 531–34. doi:10.1530/rep.1.00567. PMID 15798029. ^ Comninos AN, Jayasena CN, Dhillo WS (2014). "The relationship between gut and adipose hormones, and reproduction". Hum. Reprod. Update. 20 (2): 153–74. doi:10.1093/humupd/dmt033. PMID 24173881. ^ Zhao J, Townsend KL, Schulz LC, Kunz TH, Li C, Widmaier EP (2004). "Leptin receptor expression increases in placenta, but not hypothalamus, during gestation in Mus musculus and Myotis lucifugus". Placenta. 25 (8–9): 712–22. doi:10.1016/j.placenta.2004.01.017. PMID 15450389. ^ Moynihan AT, Hehir MP, Glavey SV, Smith TJ, Morrison JJ (2006). "Inhibitory effect of leptin on human uterine contractility in vitro". Am. J. Obstet. Gynecol. 195 (2): 504–09. doi:10.1016/j.ajog.2006.01.106. PMID 16647683. ^ Aka N, Atalay S, Sayharman S, Kiliç D, Köse G, Küçüközkan T (2006). "Leptin and leptin receptor levels in pregnant women with hyperemesis gravidarum". The Australian & New Zealand Journal of Obstetrics & Gynaecology. 46 (4): 274–77. doi:10.1111/j.1479-828X.2006.00590.x. PMID 16866785. ^ Cervero A, Domínguez F, Horcajadas JA, Quiñonero A, Pellicer A, Simón C (2006). "The role of the leptin in reproduction". Current Opinion in Obstetrics and Gynecology. 18 (3): 297–303. doi:10.1097/01.gco.0000193004.35287.89. PMID 16735830. ^ Iwaniec UT, Boghossian S, Lapke PD, Turner RT, Kalra SP (2007). "Central leptin gene therapy corrects skeletal abnormalities in leptin-deficient ob/ob mice". Peptides. 28 (5): 1012–19. doi:10.1016/j.peptides.2007.02.001. PMC 1986832. PMID 17346852. ^ Casabiell X, Piñeiro V, Tomé MA, Peinó R, Diéguez C, Casanueva FF (1997). "Presence of leptin in colostrum and/or breast milk from lactating mothers: a potential role in the regulation of neonatal food intake". J. Clin. Endocrinol. Metab. 82 (12): 4270–73. doi:10.1210/jcem.82.12.4590. PMID 9398752. ^ Sanchez-Garrido MA, Tena-Sempere M (2013). "Metabolic control of puberty: roles of leptin and kisspeptins". Horm Behav. 64 (2): 187–94. doi:10.1016/j.yhbeh.2013.01.014. PMID 23998663. ^ Matkovic V, Ilich JZ, Skugor M, Badenhop NE, Goel P, Clairmont A, Klisovic D, Nahhas RW, Landoll JD (October 1997). "Leptin is inversely related to age at menarche in human females". J. Clin. Endocrinol. Metab. 82 (10): 3239–45. doi:10.1210/jc.82.10.3239. PMID 9329346. ^ Ducy P, Amling M, Takeda S, Priemel M, Schilling AF, Beil FT, Shen J, Vinson C, Rueger JM, Karsenty G (January 2000). "Leptin inhibits bone formation through a hypothalamic relay: a central control of bone mass". Cell. 100 (2): 197–207. doi:10.1016/S0092-8674(00)81558-5. PMID 10660043. ^ a b Hamrick MW, Ferrari SL (July 2008). "Leptin and the sympathetic connection of fat to bone". Osteoporos Int. 19 (7): 905–12. doi:10.1007/s00198-007-0487-9. PMID 17924050. ^ a b Allison SJ, Herzog H (2006). "NPY and bone". EXS (95): 171–82. PMID 16383006. ^ Gordeladze JO, Reseland JE (March 2003). "A unified model for the action of leptin on bone turnover". J. Cell. Biochem. 88 (4): 706–12. doi:10.1002/jcb.10385. PMID 12577304. ^ Takeda S, Elefteriou F, Levasseur R, Liu X, Zhao L, Parker KL, Armstrong D, Ducy P, Karsenty G (November 2002). "Leptin regulates bone formation via the sympathetic nervous system". Cell. 111 (3): 305–17. doi:10.1016/S0092-8674(02)01049-8. PMID 12419242. ^ Martin A, David V, Malaval L, Lafage-Proust MH, Vico L, Thomas T (2007). "Opposite effects of leptin on bone metabolism: a dose-dependent balance related to energy intake and insulin-like growth factor-I pathway". Endocrinology. 148 (7): 3419–25. doi:10.1210/en.2006-1541. PMID 17431002. ^ Rőszer T, Józsa T, Kiss-Tóth ED, De Clerck N, Balogh L (April 2014). "Leptin receptor deficient diabetic (db/db) mice are compromised in postnatal bone regeneration". Cell and Tissue Research. 356 (1): 195–206. doi:10.1007/s00441-013-1768-6. PMID 24343796. ^ Lord GM, Matarese G, Howard JK, Baker RJ, Bloom SR, Lechler RI (August 1998). "Leptin modulates the T-cell immune response and reverses starvation-induced immunosuppression". Nature. 394 (6696): 897–901. Bibcode:1998Natur.394..897L. doi:10.1038/29795. PMID 9732873. ^ a b Fantuzzi G, Faggioni R (October 2000). "Leptin in the regulation of immunity, inflammation, and hematopoiesis". J. Leukoc. Biol. 68 (4): 437–46. PMID 11037963. ^ Caldefie-Chezet F, Poulin A, Tridon A, Sion B, Vasson MP (March 2001). "Leptin: a potential regulator of polymorphonuclear neutrophil bactericidal action?". J. Leukoc. Biol. 69 (3): 414–18. PMID 11261788. ^ Madej T, Boguski MS, Bryant SH (October 1995). "Threading analysis suggests that the obese gene product may be a helical cytokine". FEBS Lett. 373 (1): 13–18. CiteSeerX 10.1.1.467.3817. doi:10.1016/0014-5793(95)00977-H. PMID 7589424. ^ Heiman ML, Ahima RS, Craft LS, Schoner B, Stephens TW, Flier JS (September 1997). "Leptin inhibition of the hypothalamic-pituitary-adrenal axis in response to stress". Endocrinology. 138 (9): 3859–63. doi:10.1210/en.138.9.3859. PMID 9275075. ^ Mabuchi T, Yatsuya H, Tamakoshi K, Otsuka R, Nagasawa N, Zhang H, Murata C, Wada K, Ishikawa M, Hori Y, Kondo T, Hashimoto S, Toyoshima H (2005). "Association between serum leptin concentration and white blood cell count in middle-aged Japanese men and women". Diabetes Metab. Res. Rev. 21 (5): 441–47. doi:10.1002/dmrr.540. PMID 15724240. ^ Hamilton BS, Paglia D, Kwan AY, Deitel M (September 1995). "Increased obese mRNA expression in omental fat cells from massively obese humans". Nat. Med. 1 (9): 953–56. doi:10.1038/nm0995-953. PMID 7585224. ^ Perrier S, Caldefie-Chézet F, Vasson MP (January 2009). "IL-1 family in breast cancer: potential interplay with leptin and other adipocytokines". FEBS Lett. 583 (2): 259–65. doi:10.1016/j.febslet.2008.12.030. PMID 19111549. ^ Wabitsch M, Jensen PB, Blum WF, Christoffersen CT, Englaro P, Heinze E, Rascher W, Teller W, Tornqvist H, Hauner H (October 1996). "Insulin and cortisol promote leptin production in cultured human fat cells". Diabetes. 45 (10): 1435–38. doi:10.2337/diabetes.45.10.1435. PMID 8826983. ^ LaPensee CR, Hugo ER, Ben-Jonathan N (November 2008). "Insulin stimulates interleukin-6 expression and release in LS14 human adipocytes through multiple signaling pathways". Endocrinology. 149 (11): 5415–22. doi:10.1210/en.2008-0549. PMC 2584585. PMID 18617614. ^ Worm D, Vinten J, Vaag A, Henriksen JE, Beck-Nielsen H (September 2000). "The nicotinic acid analogue acipimox increases plasma leptin and decreases free fatty acids in type 2 diabetic patients". Eur. J. Endocrinol. 143 (3): 389–95. doi:10.1530/eje.0.1430389. PMID 11022182. ^ a b Caro JF, Sinha MK, Kolaczynski JW, Zhang PL, Considine RV (November 1996). "Leptin: the tale of an obesity gene". Diabetes. 45 (11): 1455–62. doi:10.2337/diab.45.11.1455. PMID 8866547. ^ Green ED, Maffei M, Braden VV, Proenca R, DeSilva U, Zhang Y, Chua SC, Leibel RL, Weissenbach J, Friedman JM (August 1995). "The human obese (OB) gene: RNA expression pattern and mapping on the physical, cytogenetic, and genetic maps of chromosome 7". Genome Res. 5 (1): 5–12. doi:10.1101/gr.5.1.5. PMID 8717050. ^ Montague CT, Farooqi IS, Whitehead JP, Soos MA, Rau H, Wareham NJ, Sewter CP, Digby JE, Mohammed SN, Hurst JA, Cheetham CH, Earley AR, Barnett AH, Prins JB, O'Rahilly S (1997). "Congenital leptin deficiency is associated with severe early-onset obesity in humans". Nature. 387 (6636): 903–08. doi:10.1038/43185. PMID 9202122. ^ a b c d e Wabitsch M, Funcke JB, Lennerz B, Kuhnle-Krahl U, Lahr G, Debatin KM, Vatter P, Gierschik P, Moepps B, Fischer-Posovszky P (Jan 2015). "Biologically Inactive Leptin and Early-Onset Extreme Obesity". N. Engl. J. Med. 372 (1): 48–54. doi:10.1056/NEJMoa1406653. PMID 25551525. ^ Farooqi, I. Sadaf; Keogh, Julia M.; Kamath, Sri; Jones, Sarah; Gibson, William T.; Trussell, Rebecca; Jebb, Susan A.; Lip, Gregory Y. H.; O'Rahilly, Stephen (November 1, 2001). "Partial leptin deficiency and human adiposity". Nature. 414 (6859): 34–35. doi:10.1038/35102112. ISSN 0028-0836. ^ a b Paracchini V, Pedotti P, Taioli E (2005). "Genetics of leptin and obesity: a HuGE review". Am. J. Epidemiol. 162 (2): 101–14. doi:10.1093/aje/kwi174. PMID 15972940. ^ Wang TN, Huang MC, Chang WT, Ko AM, Tsai EM, Liu CS, Lee CH, Ko YC (February 2006). "G-2548A polymorphism of the leptin gene is correlated with extreme obesity in Taiwanese aborigines". Obesity (Silver Spring). 14 (2): 183–87. doi:10.1038/oby.2006.23. PMID 16571841. ^ a b Zhang L, Lu M, Yuan L, Lai W, Wang Y (2014). "[Association of leptin gene-2548 G/A polymorphism with obesity: a meta-analysis]". Wei Sheng Yan Jiu (in Chinese). 43 (1): 128–32. PMID 24564125. ^ Templeman LA, Reynolds GP, Arranz B, San L (April 2005). "Polymorphisms of the 5-HT2C receptor and leptin genes are associated with antipsychotic drug-induced weight gain in Caucasian subjects with a first-episode psychosis". Pharmacogenet Genomics. 15 (4): 195–200. doi:10.1097/01213011-200504000-00002. PMID 15864111. ^ Kang SG, Lee HJ, Park YM, Choi JE, Han C, Kim YK, Kim SH, Lee MS, Joe SH, Jung IK, Kim L (2008). "Possible association between the -2548A/G polymorphism of the leptin gene and olanzapine-induced weight gain". Prog. Neuropsychopharmacol. Biol. Psychiatry. 32 (1): 160–63. doi:10.1016/j.pnpbp.2007.08.002. PMID 17804136. ^ Wu R, Zhao J, Shao P, Ou J, Chang M (2011). "Genetic predictors of antipsychotic-induced weight gain: a case-matched multi-gene study". Zhong Nan da Xue Xue Bao Yi Xue Ban. 36 (8): 720–73. doi:10.3969/j.issn.1672-7347.2011.08.003. PMID 21937795. ^ Ribeiro R, Vasconcelos A, Costa S, Pinto D, Morais A, Oliveira J, Lobo F, Lopes C, Medeiros R (2004). "Overexpressing leptin genetic polymorphism (−2548 G/A) is associated with susceptibility to prostate cancer and risk of advanced disease". Prostate. 59 (3): 268–74. doi:10.1002/pros.20004. PMID 15042602. ^ Vaskú JA, Vaskú A, Dostálová Z, Bienert P (2006). "Association of leptin genetic polymorphism -2548 G/A with gestational diabetes mellitus". Genes Nutr. 1 (2): 117–23. doi:10.1007/BF02829953. PMC 3454683. PMID 18850205. ^ Ye XL, Lu CF (Oct 2013). "Association of polymorphisms in the leptin and leptin receptor genes with inflammatory mediators in patients with osteoporosis". Endocrine. 44 (2): 481–88. doi:10.1007/s12020-013-9899-9. PMID 23460508. ^ Bado A, Levasseur S, Attoub S, Kermorgant S, Laigneau JP, Bortoluzzi MN, Moizo L, Lehy T, Guerre-Millo M, Le Marchand-Brustel Y, Lewin MJ (August 1998). "The stomach is a source of leptin". Nature. 394 (6695): 790–93. Bibcode:1998Natur.394..790B. doi:10.1038/29547. PMID 9723619. ^ Sinha MK, Opentanova I, Ohannesian JP, Kolaczynski JW, Heiman ML, Hale J, Becker GW, Bowsher RR, Stephens TW, Caro JF (September 1996). "Evidence of free and bound leptin in human circulation. Studies in lean and obese subjects and during short-term fasting". J. Clin. Invest. 98 (6): 1277–82. doi:10.1172/JCI118913. PMC 507552. PMID 8823291. ^ Lönnqvist F, Arner P, Nordfors L, Schalling M (1995). "Overexpression of the obese (ob) gene in adipose tissue of human obese subjects". Nat. Med. 1 (9): 950–53. doi:10.1038/nm0995-950. PMID 7585223. ^ Madej T (1998). "Considerations in the use of lipid-based drug products". J Intraven Nurs. 21 (6): 326. PMID 10392096. ^ Sinha MK, Ohannesian JP, Heiman ML, Kriauciunas A, Stephens TW, Magosin S, Marco C, Caro JF (March 1996). "Nocturnal rise of leptin in lean, obese, and non-insulin-dependent diabetes mellitus subjects". J. Clin. Invest. 97 (5): 1344–47. doi:10.1172/JCI118551. PMC 507189. PMID 8636448. ^ Schoeller DA, Cella LK, Sinha MK, Caro JF (October 1997). "Entrainment of the diurnal rhythm of plasma leptin to meal timing". J. Clin. Invest. 100 (7): 1882–87. doi:10.1172/JCI119717. PMC 508375. PMID 9312190. ^ Ahima RS, Prabakaran D, Mantzoros C, Qu D, Lowell B, Maratos-Flier E, Flier JS (July 1996). "Role of leptin in the neuroendocrine response to fasting". Nature. 382 (6588): 250–52. Bibcode:1996Natur.382..250A. doi:10.1038/382250a0. PMID 8717038. ^ Friedman JM (March 2009). "Leptin at 14 y of age: an ongoing story". Am. J. Clin. Nutr. 89 (3): 973S–79S. doi:10.3945/ajcn.2008.26788B. PMC 2667654. PMID 19190071. ^ Chan JL, Heist K, DePaoli AM, Veldhuis JD, Mantzoros CS (May 2003). "The role of falling leptin levels in the neuroendocrine and metabolic adaptation to short-term starvation in healthy men". J. Clin. Invest. 111 (9): 1409–21. doi:10.1172/JCI17490. PMC 154448. PMID 12727933. ^ Kolaczynski JW, Considine RV, Ohannesian J, Marco C, Opentanova I, Nyce MR, Myint M, Caro JF (November 1996). "Responses of leptin to short-term fasting and refeeding in humans: a link with ketogenesis but not ketones themselves". Diabetes. 45 (11): 1511–15. doi:10.2337/diab.45.11.1511. PMID 8866554. ^ Kolaczynski JW, Ohannesian JP, Considine RV, Marco CC, Caro JF (November 1996). "Response of leptin to short-term and prolonged overfeeding in humans". J. Clin. Endocrinol. Metab. 81 (11): 4162–65. doi:10.1210/JCEM.81.11.8923877. PMID 8923877. ^ Copinschi G, Leproult R, Spiegel K (2014). The important role of sleep in metabolism. Front Horm Res. Frontiers of Hormone Research. 42. pp. 59–72. doi:10.1159/000358858. ISBN 978-3-318-02638-2. PMID 24732925. ^ Knutson KL, Spiegel K, Penev P, Van Cauter E (June 2007). "The metabolic consequences of sleep deprivation". Sleep Med Rev. 11 (3): 163–78. doi:10.1016/j.smrv.2007.01.002. PMC 1991337. PMID 17442599. ^ Otsuka R, Yatsuya H, Tamakoshi K, Matsushita K, Wada K, Toyoshima H (October 2006). "psychological stress and serum leptin concentrations in Japanese men". Obesity (Silver Spring). 14 (10): 1832–38. doi:10.1038/oby.2006.211. PMID 17062814. ^ de Salles BF, Simão R, Fleck SJ, Dias I, Kraemer-Aguiar LG, Bouskela E (July 2010). "Effects of resistance training on cytokines". Int J Sports Med. 31 (7): 441–50. doi:10.1055/s-0030-1251994. PMID 20432196. ^ Hickey MS, Considine RV, Israel RG, Mahar TL, McCammon MR, Tyndall GL, Houmard JA, Caro JF (November 1996). "Leptin is related to body fat content in male distance runners". Am. J. Physiol. 271 (5 Pt 1): E938–40. doi:10.1152/ajpendo.1996.271.5.E938. PMID 8944684. ^ Hickey MS, Houmard JA, Considine RV, Tyndall GL, Midgette JB, Gavigan KE, Weidner ML, McCammon MR, Israel RG, Caro JF (April 1997). "Gender-dependent effects of exercise training on serum leptin levels in humans". Am. J. Physiol. 272 (4 Pt 1): E562–66. doi:10.1152/ajpendo.1997.272.4.E562. PMID 9142875. ^ Ahima RS, Flier JS (2000). "Leptin". Annu. Rev. Physiol. 62 (1): 413–37. doi:10.1146/annurev.physiol.62.1.413. PMID 10845097. ^ Kolaczynski JW, Nyce MR, Considine RV, Boden G, Nolan JJ, Henry R, Mudaliar SR, Olefsky J, Caro JF (May 1996). "Acute and chronic effects of insulin on leptin production in humans: Studies in vivo and in vitro". Diabetes. 45 (5): 699–701. doi:10.2337/diabetes.45.5.699. PMID 8621027. ^ Considine RV, Nyce MR, Kolaczynski JW, Zhang PL, Ohannesian JP, Moore JH, Fox JW, Caro JF (May 1997). "Dexamethasone stimulates leptin release from human adipocytes: unexpected inhibition by insulin". J. Cell. Biochem. 65 (2): 254–58. doi:10.1002/(SICI)1097-4644(199705)65:2<254::AID-JCB10>3.0.CO;2-I. PMID 9136082. ^ Zirlik S, Hauck T, Fuchs FS, Neurath MF, Konturek PC, Harsch IA (February 2011). "Leptin, Obestatin and Apelin levels in patients with obstructive sleep apnoea syndrome". Med. Sci. Monit. 17 (3): CR159–64. doi:10.12659/MSM.881450. PMC 3524733. PMID 21358603. ^ Harsch IA, Konturek PC, Koebnick C, Kuehnlein PP, Fuchs FS, Pour Schahin S, Wiest GH, Hahn EG, Lohmann T, Ficker JH (August 2003). "Leptin and ghrelin levels in patients with obstructive sleep apnoea: effect of CPAP treatment". Eur. Respir. J. 22 (2): 251–57. doi:10.1183/09031936.03.00010103. PMID 12952256. ^ a b Myers MG, Cowley MA, Münzberg H (2008). "Mechanisms of leptin action and leptin resistance". Annu. Rev. Physiol. 70 (1): 537–56. doi:10.1146/annurev.physiol.70.113006.100707. PMID 17937601. ^ a b Veyrat-Durebex C, Poher AL, Caillon A, Somm E, Vallet P, Charnay Y, Rohner-Jeanrenaud F (2013). "Improved leptin sensitivity as a potential candidate responsible for the spontaneous food restriction of the Lou/C rat". PLoS ONE. 8 (9): e73452. Bibcode:2013PLoSO...873452V. doi:10.1371/journal.pone.0073452. PMC 3765307. PMID 24039946. ^ a b Caro JF, Kolaczynski JW, Nyce MR, Ohannesian JP, Opentanova I, Goldman WH, Lynn RB, Zhang PL, Sinha MK, Considine RV (20 July 1996). "Decreased cerebrospinal-fluid/serum leptin ratio in obesity: a possible mechanism for leptin resistance". Lancet. 348 (9021): 159–61. doi:10.1016/S0140-6736(96)03173-X. PMID 8684156. ^ Considine RV, Considine EL, Williams CJ, Hyde TM, Caro JF (1996). "The hypothalamic leptin receptor in humans: identification of incidental sequence polymorphisms and absence of the db/db mouse and fa/fa rat mutations". Diabetes. 45 (7): 992–94. doi:10.2337/diabetes.45.7.992. PMID 8666155. ^ Considine RV, Caro JF (November 1997). "Leptin and the regulation of body weight". Int. J. Biochem. Cell Biol. 29 (11): 1255–72. doi:10.1016/S1357-2725(97)00050-2. PMID 9451823. ^ a b Oswal A, Yeo G (February 2010). "Leptin and the control of body weight: a review of its diverse central targets, signaling mechanisms, and role in the pathogenesis of obesity". Obesity (Silver Spring). 18 (2): 221–29. doi:10.1038/oby.2009.228. PMID 19644451. ^ Shapiro A, Mu W, Roncal C, Cheng KY, Johnson RJ, Scarpace PJ (November 2008). "Fructose-induced leptin resistance exacerbates weight gain in response to subsequent high-fat feeding". Am. J. Physiol. Regul. Integr. Comp. Physiol. 295 (5): R1370–75. doi:10.1152/ajpregu.00195.2008. PMC 2584858. PMID 18703413. ^ Vasselli JR (November 2008). "Fructose-induced leptin resistance: discovery of an unsuspected form of the phenomenon and its significance. Focus on "Fructose-induced leptin resistance exacerbates weight gain in response to subsequent high-fat feeding," by Shapiro et al". Am. J. Physiol. Regul. Integr. Comp. Physiol. 295 (5): R1365–69. doi:10.1152/ajpregu.90674.2008. PMID 18784330. ^ Harris RB, Apolzan JW (Jun 2012). "Changes in glucose tolerance and leptin responsiveness of rats offered a choice of lard, sucrose, and chow". Am J Physiol Regul Integr Comp Physiol. 302 (11): R1327–39. doi:10.1152/ajpregu.00477.2011. PMC 3378343. PMID 22496363. ^ Roth JD, Roland BL, Cole RL, Trevaskis JL, Weyer C, Koda JE, Anderson CM, Parkes DG, Baron AD (May 2008). "Leptin responsiveness restored by amylin agonism in diet-induced obesity: evidence from nonclinical and clinical studies". Proc. Natl. Acad. Sci. USA. 105 (20): 7257–62. Bibcode:2008PNAS..105.7257R. doi:10.1073/pnas.0706473105. PMC 2438237. PMID 18458326. ^ Banks WA, Farr SA, Morley JE (June 2006). "The effects of high fat diets on the blood-brain barrier transport of leptin: failure or adaptation?". Physiol. Behav. 88 (3): 244–48. doi:10.1016/j.physbeh.2006.05.037. PMID 16781741. ^ Wang J, Obici S, Morgan K, Barzilai N, Feng Z, Rossetti L (December 2001). "Overfeeding rapidly induces leptin and insulin resistance". Diabetes. 50 (12): 2786–91. doi:10.2337/diabetes.50.12.2786. PMID 11723062. ^ Enriori PJ, Evans AE, Sinnayah P, Jobst EE, Tonelli-Lemos L, Billes SK, Glavas MM, Grayson BE, Perello M, Nillni EA, Grove KL, Cowley MA (March 2007). "Diet-induced obesity causes severe but reversible leptin resistance in arcuate melanocortin neurons". Cell Metab. 5 (3): 181–94. doi:10.1016/j.cmet.2007.02.004. PMID 17339026. ^ Obici S, Rossetti L (December 2003). "Minireview: nutrient sensing and the regulation of insulin action and energy balance". Endocrinology. 144 (12): 5172–78. doi:10.1210/en.2003-0999. PMID 12970158. ^ a b Ahima RS (July 2008). "Revisiting leptin's role in obesity and weight loss". J. Clin. Invest. 118 (7): 2380–83. doi:10.1172/JCI36284. PMC 2430504. PMID 18568083. ^ Yusuf E, Nelissen RG, Ioan-Facsinay A, Stojanovic-Susulic V, DeGroot J, van Osch G, Middeldorp S, Huizinga TW, Kloppenburg M (2010). "Association between weight or body mass index and hand osteoarthritis: a systematic review". Annals of the Rheumatic Diseases. 69 (4): 761–65. doi:10.1136/ard.2008.106930. PMID 19487215. ^ Sowers MR, Karvonen-Gutierrez CA (2010). "The evolving role of obesity in knee osteoarthritis". Current Opinion in Rheumatology. 22 (5): 533–37. doi:10.1097/BOR.0b013e32833b4682. PMC 3291123. PMID 20485173. ^ Aspden RM, Scheven BA, Hutchison JD (2001). "Osteoarthritis as a systemic disorder including stromal cell differentiation and lipid metabolism". Lancet. 357 (9262): 1118–20. doi:10.1016/S0140-6736(00)04264-1. PMID 11297982. ^ Pottie P, Presle N, Terlain B, Netter P, Mainard D, Berenbaum F (2006). "Obesity and osteoarthritis: more complex than predicted!". Annals of the Rheumatic Diseases. 65 (11): 1403–05. doi:10.1136/ard.2006.061994. PMC 1798356. PMID 17038451. ^ Griffin TM, Guilak F (2008). "Why is obesity associated with osteoarthritis? Insights from mouse models of obesity". Biorheology. 45 (3–4): 387–98. doi:10.3233/BIR-2008-0485. PMC 2748656. PMID 18836239. ^ Masuko K, Murata M, Suematsu N, Okamoto K, Yudoh K, Nakamura H, Kato T (2009). "A metabolic aspect of osteoarthritis: lipid as a possible contributor to the pathogenesis of cartilage degradation". Clinical and Experimental Rheumatology. 27 (2): 347–53. PMID 19473582. ^ Hu PF, Bao JP, Wu LD (2011). "The emerging role of adipokines in osteoarthritis: a narrative review". Molecular Biology Reports. 38 (2): 873–78. doi:10.1007/s11033-010-0179-y. PMID 20480243. ^ Coppari R, Bjørbæk C (2012). "Leptin revisited: its mechanism of action and potential for treating diabetes". Nature Reviews. Drug Discovery. 11 (9): 692–708. doi:10.1038/nrd3757. PMC 4019022. PMID 22935803. ^ Gualillo O (2007). "Further evidence for leptin involvement in cartilage homeostases". Osteoarthritis and Cartilage. 15 (8): 857–60. doi:10.1016/j.joca.2007.04.015. PMID 17560812. ^ Ouchi N, Parker JL, Lugus JJ, Walsh K (2011). "Adipokines in inflammation and metabolic disease". Nature Reviews. Immunology. 11 (2): 85–97. doi:10.1038/nri2921. PMC 3518031. PMID 21252989. ^ Scotece M, Conde J, Vuolteenaho K, Koskinen A, López V, Gómez-Reino J, Lago F, Moilanen E, Gualillo O (2014). "Adipokines as drug targets in joint and bone disease". Drug Discovery Today. 19 (3): 241–58. doi:10.1016/j.drudis.2013.07.012. PMID 23906693. ^ a b Dumond H, Presle N, Terlain B, Mainard D, Loeuille D, Netter P, Pottie P (2003). "Evidence for a key role of leptin in osteoarthritis". Arthritis and Rheumatism. 48 (11): 3118–29. doi:10.1002/art.11303. PMID 14613274. ^ a b Simopoulou T, Malizos KN, Iliopoulos D, Stefanou N, Papatheodorou L, Ioannou M, Tsezou A (2007). "Differential expression of leptin and leptin's receptor isoform (Ob-Rb) mRNA between advanced and minimally affected osteoarthritic cartilage; effect on cartilage metabolism". Osteoarthritis and Cartilage. 15 (8): 872–83. doi:10.1016/j.joca.2007.01.018. PMID 17350295. ^ Vuolteenaho K, Koskinen A, Moilanen T, Moilanen E (2012). "Leptin levels are increased and its negative regulators, SOCS-3 and sOb-R are decreased in obese patients with osteoarthritis: a link between obesity and osteoarthritis". Annals of the Rheumatic Diseases. 71 (11): 1912–13. doi:10.1136/annrheumdis-2011-201242. PMID 22689314. ^ Gandhi R, Takahashi M, Syed K, Davey JR, Mahomed NN (2010). "Relationship between body habitus and joint leptin levels in a knee osteoarthritis population". Journal of Orthopaedic Research : Official Publication of the Orthopaedic Research Society. 28 (3): 329–33. doi:10.1002/jor.21000. PMID 19780190. ^ Presle N, Pottie P, Dumond H, Guillaume C, Lapicque F, Pallu S, Mainard D, Netter P, Terlain B (2006). "Differential distribution of adipokines between serum and synovial fluid in patients with osteoarthritis. Contribution of joint tissues to their articular production". Osteoarthritis and Cartilage. 14 (7): 690–95. doi:10.1016/j.joca.2006.01.009. PMID 16527497. ^ Morroni M, De Matteis R, Palumbo C, Ferretti M, Villa I, Rubinacci A, Cinti S, Marotti G (2004). "In vivo leptin expression in cartilage and bone cells of growing rats and adult humans". Journal of Anatomy. 205 (4): 291–96. doi:10.1111/j.0021-8782.2004.00333.x. PMC 1571344. PMID 15447688. ^ Järvinen K, Vuolteenaho K, Nieminen R, Moilanen T, Knowles RG, Moilanen E (2008). "Selective iNOS inhibitor 1400W enhances anti-catabolic IL-10 and reduces destructive MMP-10 in OA cartilage. Survey of the effects of 1400W on inflammatory mediators produced by OA cartilage as detected by protein antibody array". Clinical and Experimental Rheumatology. 26 (2): 275–82. PMID 18565249. ^ a b Distel E, Cadoudal T, Durant S, Poignard A, Chevalier X, Benelli C (2009). "The infrapatellar fat pad in knee osteoarthritis: an important source of interleukin-6 and its soluble receptor". Arthritis and Rheumatism. 60 (11): 3374–77. doi:10.1002/art.24881. PMID 19877065. ^ Clockaerts S, Bastiaansen-Jenniskens YM, Runhaar J, Van Osch GJ, Van Offel JF, Verhaar JA, De Clerck LS, Somville J (2010). "The infrapatellar fat pad should be considered as an active osteoarthritic joint tissue: a narrative review". Osteoarthritis and Cartilage. 18 (7): 876–82. doi:10.1016/j.joca.2010.03.014. PMID 20417297. ^ Klein-Wieringa IR, Kloppenburg M, Bastiaansen-Jenniskens YM, Yusuf E, Kwekkeboom JC, El-Bannoudi H, Nelissen RG, Zuurmond A, Stojanovic-Susulic V, Van Osch GJ, Toes RE, Ioan-Facsinay A (2011). "The infrapatellar fat pad of patients with osteoarthritis has an inflammatory phenotype". Annals of the Rheumatic Diseases. 70 (5): 851–57. doi:10.1136/ard.2010.140046. PMID 21242232. ^ Hui W, Litherland GJ, Elias MS, Kitson GI, Cawston TE, Rowan AD, Young DA (2012). "Leptin produced by joint white adipose tissue induces cartilage degradation via upregulation and activation of matrix metalloproteinases". Annals of the Rheumatic Diseases. 71 (3): 455–62. doi:10.1136/annrheumdis-2011-200372. PMID 22072016. ^ Sinha G (2014). "Leptin therapy gains FDA approval". Nat. Biotechnol. 32 (4): 300–02. doi:10.1038/nbt0414-300b. PMID 24714458. ^ Chou K, Perry CM (2013). "Metreleptin: first global approval". Drugs. 73 (9): 989–97. doi:10.1007/s40265-013-0074-7. PMID 23740412. ^ "FDA approves Myalept to treat rare metabolic disease". FDA. 25 February 2014. Retrieved 30 April 2014. ^ "Myalepta | European Medicines Agency". www.ema.europa.eu. Retrieved 2019-01-09. ^ "NHS England » Metreleptin for congenital leptin deficiency (all ages)". www.england.nhs.uk. Retrieved 2019-01-18. ^ "The Rockefeller University » Hospital Centennial". centennial.rucares.org. Retrieved 2018-10-11. ^ Dickie MM, Lane PW (1957). "Plus letter to Roy Robinson 7/7/70". Mouse News Lett. (17): 52. ^ Bahary N, Siegel DA, Walsh J, Zhang Y, Leopold L, Leibel R, Proenca R, Friedman JM (September 1993). "Microdissection of proximal mouse chromosome 6: identification of RFLPs tightly linked to the ob mutation". Mamm. Genome. 4 (9): 511–15. doi:10.1007/BF00364786. PMID 7906968. ^ Friedman JM, Leibel RL, Siegel DS, Walsh J, Bahary N (December 1991). "Molecular mapping of the mouse ob mutation". Genomics. 11 (4): 1054–62. doi:10.1016/0888-7543(91)90032-A. PMID 1686014. ^ a b Zhang Y, Proenca R, Maffei M, Barone M, Leopold L, Friedman JM (December 1994). "Positional cloning of the mouse obese gene and its human homologue". Nature. 372 (6505): 425–32. Bibcode:1994Natur.372..425Z. doi:10.1038/372425a0. PMID 7984236. ^ Leibel RL, Bahary N, Friedman JM (January 1990). Genetic variation and nutrition in obesity: approaches to the molecular genetics of obesity. World Rev Nutr Diet. World Review of Nutrition and Dietetics. 63. pp. 90–101. doi:10.1159/000418501. ISBN 978-3-8055-5126-7. PMID 1973864. ^ Bahary N, Leibel RL, Joseph L, Friedman JM (November 1990). 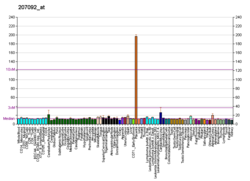 "Molecular mapping of the mouse db mutation". Proc Natl Acad Sci USA. 87 (21): 8642–46. Bibcode:1990PNAS...87.8642B. doi:10.1073/pnas.87.21.8642. PMC 55013. PMID 1978328. ^ Leibel RL, Bahary N, Friedman JM (January 1993). "Strategies for the molecular genetic analysis of obesity in humans". Crit Rev Food Sci Nutr. 33 (4–5): 351–58. doi:10.1080/10408399309527632. PMID 8357496. ^ Neill US (1 October 2010). "Leaping for leptin: the 2010 Albert Lasker Basic Medical Research Award goes to Douglas Coleman and Jeffrey M. Friedman". Journal of Clinical Investigation. 120 (10): 3413–18. doi:10.1172/JCI45094. PMC 2947251. ^ Conde J, Scotece M, Gómez R, López V, Gómez-Reino JJ, Lago F, Gualillo O (2011). "Adipokines: Biofactors from white adipose tissue. A complex hub among inflammation, metabolism, and immunity". BioFactors. 37 (6): 413–20. doi:10.1002/biof.185. PMID 22038756. ^ Tartaglia LA, Dembski M, Weng X, Deng N, Culpepper J, Devos R, Richards GJ, Campfield LA, Clark FT, Deeds J, Muir C, Sanker S, Moriarty A, Moore KJ, Smutko JS, Mays GG, Wool EA, Monroe CA, Tepper RI (December 1995). "Identification and expression cloning of a leptin receptor, OB-R". Cell. 83 (7): 1263–71. doi:10.1016/0092-8674(95)90151-5. PMID 8548812. ^ Chen H, Charlat O, Tartaglia LA, Woolf EA, Weng X, Ellis SJ, Lakey ND, Culpepper J, Moore KJ, Breitbart RE, Duyk GM, Tepper RI, Morgenstern JP (February 1996). "Evidence that the diabetes gene encodes the leptin receptor: identification of a mutation in the leptin receptor gene in db/db mice". Cell. 84 (3): 491–95. doi:10.1016/S0092-8674(00)81294-5. PMID 8608603. ^ Lee GH, Proenca R, Montez JM, Carroll KM, Darvishzadeh JG, Lee JI, Friedman JM (February 1996). "Abnormal splicing of the leptin receptor in diabetic mice". Nature. 379 (6566): 632–65. Bibcode:1996Natur.379..632L. doi:10.1038/379632a0. PMID 8628397. ^ Chua SC, Chung WK, Wu-Peng XS, Zhang Y, Liu SM, Tartaglia L, Leibel RL (February 1996). "Phenotypes of mouse diabetes and rat fatty due to mutations in the OB (leptin) receptor". Science. 271 (5251): 994–96. Bibcode:1996Sci...271..994C. doi:10.1126/science.271.5251.994. PMID 8584938. ^ Bonner J (2005). "Jeffrey Friedman, discoverer of leptin, receives Gairdner, Passano awards". Newswire. The Rockefeller University. ^ "Jeffrey Friedman receives Shaw Prize for discovery of leptin". News-Medical.net. 2009. ^ "The Lasker Foundation – 2010 Awards". Lasker Foundation. 2010. ^ "BBVA Foundation Frontiers of Knowledge Awards". BBVA Foundation. 2012. ^ "KFF – KFIP – Winners 2013 – Medicine". King Faisal Foundation. 2013. ^ Castracane VD, Henson MC (2006). "The Obese (ob/ob) Mouse and the Discovery of Leptin". In Castracane VD, Henson MC (eds.). Leptin. Endocrine Updates. 25. pp. 1–9. doi:10.1007/978-0-387-31416-7_1. ISBN 978-0-387-31415-0. Wikimedia Commons has media related to Leptin.